While NASA intends to send more spacecrafts and ultimately humans to Mars, its scientists are faced with the difficulty of having to rethink the conception of the parachute. Mars is quite a tricky environment to land on, quite unlike the moon. It has a thick atmosphere, making it difficult to land using a rocket alone. However, it’s too thin to allow a big parachute to gain traction. Missions to Mars so far had used a mixture of the two, rocket and parachute while adding other means to slow a lander. However, the larger the craft, the difficulty is accrued. In order to address this issue, NASA is striving to find alternatives through the Low-Density Supersonia Decelerator program. This would in time yield a high-tech version of a flying saucer and balloon combined. The diameter of the saucer would vary between 6 to 8 meters. This will create an enormous drag with an inflatable donut. Then a 30.5 meter parachute will take over with the landing. Last summer, the system was first tested in Hawaii. Another test flight is scheduled for June. 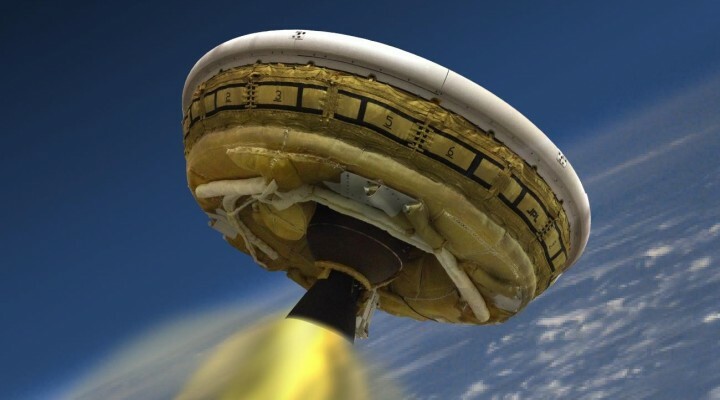 This month, the Jet Propulsion Laboratory in California would be subjecting the saucer to a spin table in order to ensure that it is properly balanced and apt for a flight. The LDSD team mates would also be available to answer any questions that viewers might have. NASA has provided more information regarding the craft on the project’s home page. This includes a photo gallery from its last testing and a fact sheet. The system could be in action on Mars around the 2020 if everything goes according to plans.